A new study of sediments from the Atlantic bottom directly links this slowdown with a massive buildup of carbon dragged from the air into the abyss. With the system running at full speed, this carbon would have percolated back into the air fairly quickly, but during this period it just stagnated in the depths. This suggests that the carbon drawdown cooled the planet—the opposite of the greenhouse effect we are seeing now, as humans pump carbon into the atmosphere. But if the current keeps slowing now, we should not expect it to help us out by storing our emissions; possibly to the contrary. The study, led by researchers at Columbia University’s Lamont-Doherty Earth Observatory, appears this week in the journal Nature Geoscience. Left: Before about 950,000 years ago, waters reached the deep Atlantic Ocean from the north (black arrows) and south (purple arrows). 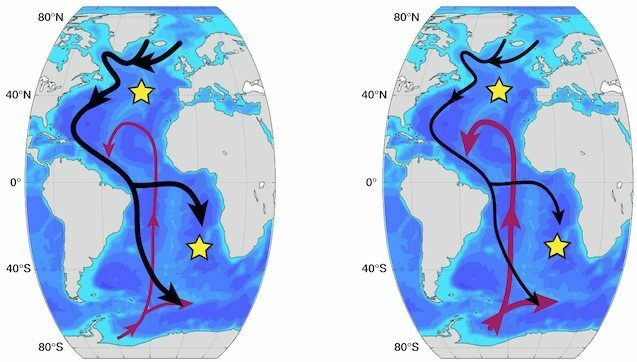 Right: Using data from two sediment cores (yellow stars), scientists showed that a weakening of the northern-sourced circulation (thinner black arrows) after that led to more carbon storage in the Atlantic. 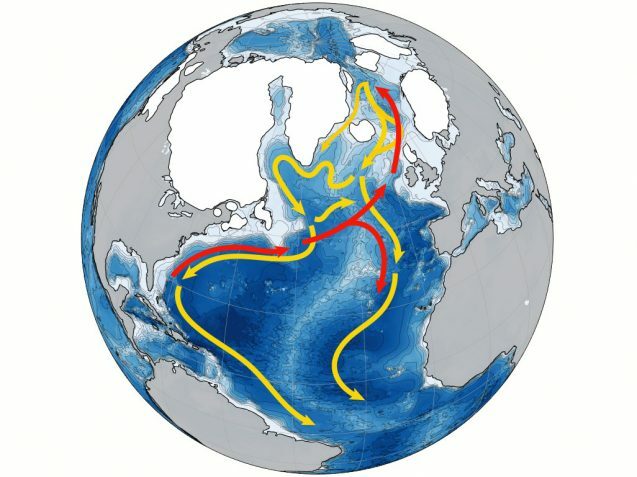 Under a weaker circulation, more of the deep Atlantic water was sourced from the south. Citation: Deep Atlantic Ocean carbon storage and the rise of 100,000-year glacial cycles.